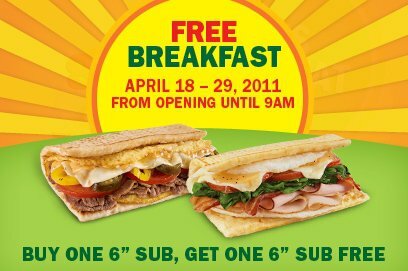 Now through 4/29 you can stop by your local Subway before 9AM each morning and buy a 6 inch sub and get another FREE…no coupon needed (some restrictions apply)! May I suggest ordering one for breakfast and saving one for lunch? Hey, now that’s what I call FAST FOOD! You’ll be on your way in no time and way ahead of your day. You may want to call your local restaurant to be certain they are participating.